Starbar Fly Trap Attractant Refill. $9.99. "Never had anything attract and kill flies like this product." Never had anything attract and kill flies like this product. I highly recommend it. "This is the greatest stuff I have ever used." This is the greatest stuff I have ever used. Within a hour the bait trap was half full of flies and just continues to work days later. Will be buying this product again. Starbar Fly Trap Attractant is a special dry formulation that comes in water soluble packs for use with Starbar fly traps including the Fly Terminator Pro and other half-gallon and gallon-sized reusable fly traps. 1. Use attractants promptly after removing from package, and keep them dry during handling. 2. Open zipper bag to remove water-soluble attractant pouch and drop pouch into trap. Handle with dry hands or use gloves. 3. Do not open the individual pouches. They will dissolve in the trap water. 4. Reseal zipper bag after removing water-soluble attractant pouch(es), and keep sealed when not in use. 5. Add water to fill line as indicated on trap or see fly trap use directions. 6. Replace fly trap top securely. 7. Hang or place trap outside near a fly source. 8. Wash hands with soap and water after handling. 9. Empty trap and replace attractant when trap dries out or becomes full of flies, or after 30 days, whichever comes first. 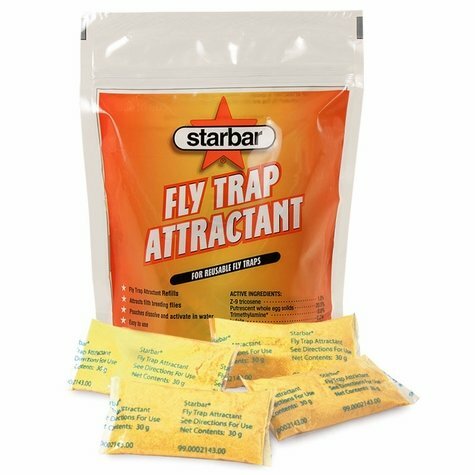 USAGE RATES: For Starbar and other gallon-sized reusable fly traps, place two water-soluble attractant pouches into trap and add one-half gallon of clean water to activate attractant. For Starbar and other half-gallon-sized reusable fly traps, place one water-soluble attractant pouch into trap and add one quart of lean water to activate attractant. NOTE: Not for indoor use, nor for use against biting flies. Contents may give off bad odor; do not allow contents to contact hands or clothing.